According to Storch et al. 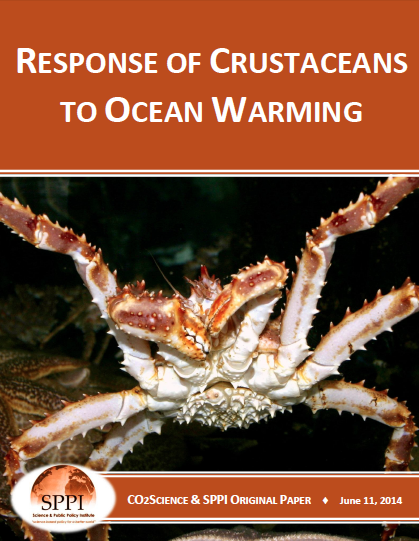 (2009), "temperature is often invoked as the main determinant of distribution ranges and boundaries for marine and terrestrial species," and they note the larval stages of many marine species "are more vulnerable to thermal and osmotic stresses than adults." Consequently, they explored the rigidity of this temperature determinant of livable range for the Chilean kelp crab (Taliepus dentatus) in its most temperature-sensitive larval state. Local copepod diversity, especially in extra-tropical regions, is likely to increase with climate change as their large-scale distributions respond to climate warming. This state of affairs is much the same as what has typically been found on land for birds, butterflies, and several other terrestrial lifeforms, as their ranges expand and overlap in response to global warming. With more territory thus available to them, their "foothold" on the planet becomes ever stronger, fortifying them against forces that might otherwise lead to their extinction.